In a twist of my ancient history section of the blog, some news from ancient Egypt rather than Rome. 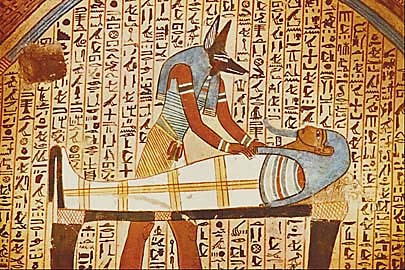 Next, for the main course of this article (a comment whose taste will be made clear soon enough) we have some specific details: Ancient Egyptian mummification ‘recipe’ revealed. The title is probably a bit too dramatic, as titles often are, as the general ingredients have been known for a while. Interestingly, when analysing the specific formula the researchers have identified tree resin, likely used for its antibacterial properties. Another ingredient that was possibly used for the same reasons is honey. Honey is an amazing thing. Due to several factors of its chemical composition (hyper-saturation of sugars, bee enzymes, etc.) it doesn’t spoil. It has long been used in medicine, as well as one of the world’s oldest alcoholic drinks (mead). Jars of honey have been found in ancient Egyptian tombs, either as buried treasures or offering to the gods. There is some evidence that it was also used as an ingredient in mummification. This may make you go off sweets for a while, but it isn’t too far fetched. Herodotus reports that Assyrians embalmed their dead in honey, and evidence of the practice has been found from the Caucasus to Egypt to China (though if you ask me, mellification stems from a Chinese misunderstanding of reports of the practice). In fact, it’s possible that the body of Alexander the Great was submerged in honey to preserve it. Plutarch cites Egyptian mummification, but Wallis Budge suggests honey as there was a two year gap between dying in Mesopotamia till his body was moved to Egypt, and the technique was known in both places. Thanks for the interesting post. You never fail me. Darn WordPress won’t accept my “like”. I’ve had the same, and I think it’s a browser issue. I always have to either switch or press the like link in the original email. I will try that next time.